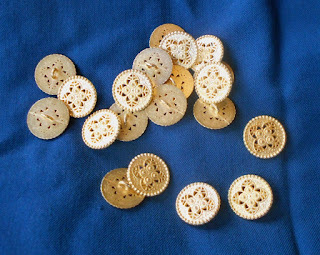 Yesterday these lovely metal buttons arrived from India (Indian Beautiful Art on eBay). They're naturally not based on a medieval find, but I think they have a lovely gothic feel to them. And I now have 140 of them. maybe 16 will be used on Måns' gown, and I will doubtlessly find use for the rest . I need a green sleeveless surcoat.